Swedish police have confirmed they discovered a suspect device inside the lorry which was driven into a Stockholm department store on Friday. 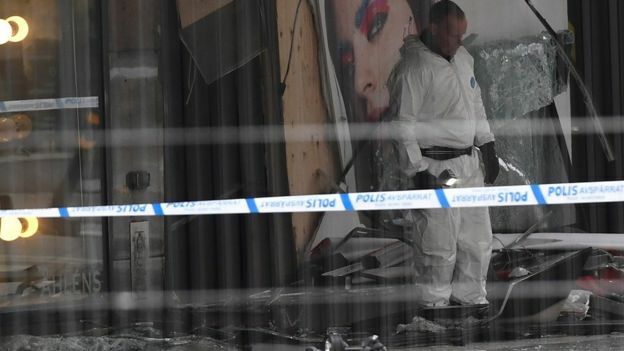 The device was found in the driver’s seat, National Police Commissioner Dan Eliasson said, but it was not known whether it was a bomb. Mr Eliasson also said the suspect in custody was from Uzbekistan, 39, and known to security services. The hijacked lorry was driven into Ahlens department store in the capital. Four people were killed – 10 remain in hospital, including a child. Two are in intensive care. The suspect, who was not named, was known to the security services. However, he had only been seen as a “marginal character”, Mr Eliasson said. 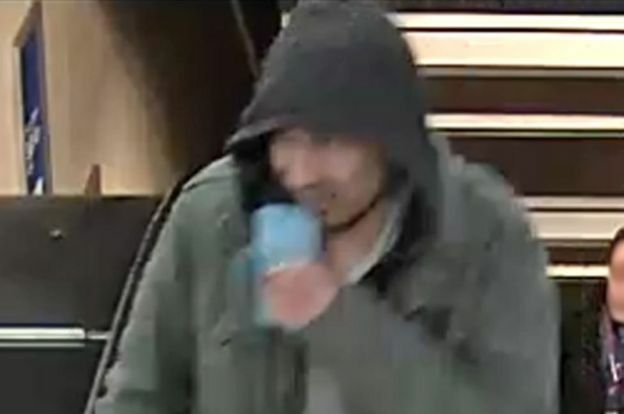 The head of Swedish security police, Anders Thornberg, said the suspect was “a person who has previously figured in our intelligence flow”. It is not clear if the suspect was resident in Sweden. Mr Eliasson said police had reason to believe the suspect was the man behind the attack. On Saturday, there were reports of more police raids in Sweden. However, police told Reuters they had not made any further arrests. Was there a bomb in the lorry? Police say it is too early to tell what the “technical device” in the lorry was – only that “it should not be there”. “I cannot say at this stage that this is a bomb or some sort of flammable material,” Mr Eliasson said. What is the Swedish government doing? Swedish Prime Minister Stefan Lofven has called it a terrorist attack, with borders tightened at his request. “Terrorists can never defeat Sweden, never,” Mr Lofven said. The mayor of Stockholm, Karin Wanngard, reiterated that Stockholm was open. “This is not an attack that’s about the colour of your skin,” she said. He added that those “who want to help, are more than those who want to hurt us”. 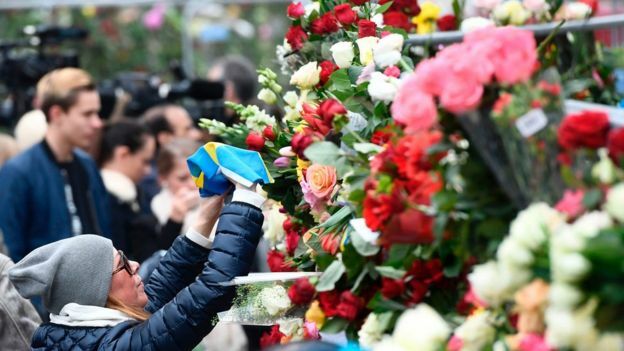 There will be a minute’s silence in Sweden at midday on Monday to commemorate the dead. Has Sweden experienced similar attacks before? Sweden has generally low crime rates, and has been ranked as one of the safest countries in the world. In 2010, two bombs detonated in central Stockholm, killing the attacker – an Iraq-born Swedish man – and injuring two others. In February, US President Donald Trump cited a non-existent terror attack in Sweden, and blamed it on the country’s asylum policy – baffling many Swedes. Sweden has taken in nearly 200,000 refugees and migrants in recent years – more per capita than any other European country. However, there was a drop in numbers last year after the country introduced new border checks. Separately, Sweden is believed to have the highest number of Islamic State group fighters per capita in Europe. About 140 of the 300 who went to Syria and Iraq have since returned, leaving the authorities to grapple with how best to reintegrate them into society.